The Toy Wizards (well, at least one of us, anyway) are in Japan for the recent Wonder Festival (WonderFest 2019), but the toy scoping fun doesn’t stop there. As we’ve reported before, while Toys R Us lie dormant in the US, it is alive and thriving in many parts of Asia. Fortunately for us, this includes Japan. So, what does a Japanese Toys R Us look like? What are the hottest toys for kids over there, and what do the displays look like? We’re glad you asked! 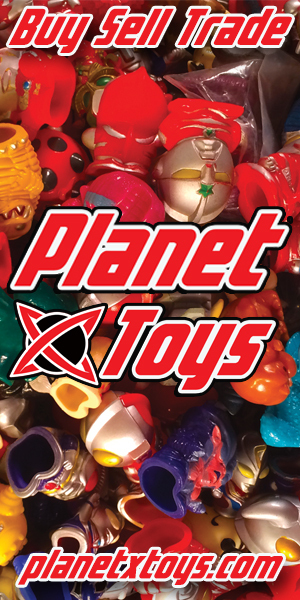 Because today on Toy Wizards, we’re visiting an old friend, and seeing how the American and Japanese products differ! For the most part, the stores are pretty similar. But it’s once you start seeing those little nuances in the displays that things start getting interesting. Starting in the ‘girl aisle’, it’s easy to see that PreCure (Pretty Cure) is thriving over there, whereas anime toys in the US aren’t quite as prevalent. Here is something exclusive to Japan; the Ultraman Kaiju wall. These incredible vinyl figures go for about 500 yen, which is a little under $5. Not only are thee toys super nice looking, but something we definitely never saw in an American Toys R Us! Franchises like Transformers, Star Wars, and Zoids are extremely visible in Japan (both at Toys R Us and from our WonderFest footage). Plus, Japanese Toys R Us has a wall devoted to model kits. Hear that, kids? You don’t have to settle for more copies of Monopoly! Toys R Us in Japan is exciting. It’s familiar with its family games and baby items, yet different enough with the ‘collectibles’ that we just can’t casually procure in the states. Check out our full gallery below and reclaim your status as a Toys R Us kid!